The North American version of the Sonic Forces launch trailer was officially released by SEGA today. Unfortunately, unlike the Italian version we reported on a few weeks ago, this trailer contains some serious spoilers. Not just unannounced levels like the Sonic Mania, but actual footage of the game’s final boss and ending cutscenes. Did you enjoy all that spoiler-dodging in the wake of the Sonic Mania leaks? Well, we’ve got good news for you: you get to do it again with Sonic Forces! At least several copies of the Switch version of the game have been sold early by as-yet unknown retailers. Unfortunately, while the person who posted the images in the above tweet has refused to leak anything, others haven’t been so restrained. Sonic Forces streams are reportedly already popping up, though SEGA is taking them down. Just like with Sonic Mania, we won’t be reporting on the impending wave of spoilers from these streams. If you want to avoid them, you may want to stay off social media and message boards until you’ve played the game yourself. Sonic Forces will release be released for the Switch, PS4, Xbox One and PC on November 7. New playable characters (and other resources) for Sonic Runners have been revealed within the game’s data, thanks to some our our more tech savvy members on our board, the SSMB. Back when the game was initially announced, several characters were revealed for the game. Aside from the main trio we were also shown renders of Amy, Shadow, Rouge, Vector, Espio and Charmy. However, the list of playable characters evidently expands much further than that! Within the game’s files, models for characters unseen in trailers were shown – including Blaze, Silver, Omega, Metal Sonic… and what could be the most important reveal, Big the Cat! Currently, the only available characters within the game are Sonic, Tails and Knuckles, with Amy also available – if of course, you manage to invite ten Facebook friends and get them to download the title. The rest of the cast seemingly has no unlock criteria yet, and will likely come in future updates. This isn’t the end of what’s been found in the game’s files however. There’s also images of characters from Secret Rings, Black Knight, Lost World and Adventure (Froggy!). It seems that Runners isn’t holding back on celebrating the many different games the hedgehog starred in and the characters that appeared there. And finally, more gems have shown themselves, showing alternative version of existing characters, though we’re not exactly sure how they came to be… it seems that Espio has got himself a metal coating, and somebody made Shadow and Omega pretty angry. A very creepy Metal Eggman has also been found. This story is continuing to develop as more resources are unearthed, so keep an eye on our Twitter for updates! Credit to finding these goes to Woun and Mefiresu over on the SSMB forums. Beware Spoilers! 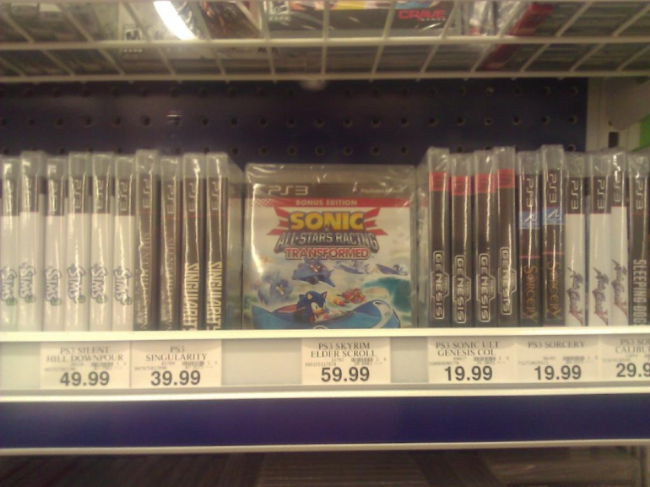 Sonic Lost World’s Street Date Broken! We’re getting reports that Sonic Lost World for the Wii U has been leaked onto youtube, there are several videos popping up from Spanish accounts which suggest that a retailer may have broken the release date for the game. One of the accounts doesn’t appear to be affiliated with any major media/press site outside of a Facebook fan page. As of now, theres nothing to suggest that this is an official embargo or authorised release which suggests that the game has had it’s street date broken. At this point in time we’re not going to be posting leaked material on the front page of TSS since I imagine a few of you will be a bit annoyed if we did that. However, it is being discussed on our forums, so if you can’t wait a few days, head there. So far the leaked material includes the entire openning cut scene, the first few stages, and several unseen cutscenes and plot elements. Spoilers await you at this link. Beware Spoilers! ASRT’s Street Date Broken! Oh my days! Oh my Days! Look! A store is charging forty big ones for Singularity! I know it’s a good game but it’s quite old and the online is… oh… you’re more interested about that game with the hedgehog in the car right? Your eyes are not deceiving you, some naughty retailers have broken the release date for ASRT and are now selling it in store. As a result many of the surprises that the game had in store are slowly being posted online. Continue reading Beware Spoilers! ASRT’s Street Date Broken!